È il titolo comparso intorno alle 10:20 (ora italiana) di ieri nell’area amministrativa di Office 365 (a voler fare i pignoli si parla di 2019-01-24 09:17 (UTC)). Una manciata di minuti prima della comparsa dell’anomalia il team di primo livello ha cominciato a ricevere segnalazioni dagli utenti che non accedevano più al loro Outlook e in generale alla posta elettronica di Exchange in Cloud (quindi anche via OWA). Il tempo di aprire un ticket in Microsoft ed ecco spuntare fuori il primo aggiornamento sull’area amministrativa del servizio, sarebbe stato il primo di tanti: “We’re investigating a potential issue and checking for impact to your organization. We’ll provide an update within 60 minutes.“. La chiamano “Riduzione del servizio“, si traduce con “Panico totale e corsa ai ripari” perché nonostante ciò che si continua a sbraitare in giro, la posta elettronica è e rimane al centro dell’universo per tutti coloro che svolgono un lavoro d’ufficio, intersecandosi anche in altri settori che tramite essa portano a termine compiti automatizzati e non (penso alla realtà di un grande gruppo come quello per cui lavoro, ma di nomi presi in pieno volto oggi se ne potrebbero fare parecchi altri, assai conosciuti) dove persino il mestiere più manuale è comunque preso “di striscio” dal colpo. L’incidente frontale ti fa capire quanto una struttura in Cloud, seppur curata e tenuta sempre d’occhio, possa rivelarsi un grandissimo Point of Failure davanti al quale tu sei completamente impotente, a prescindere dalla preparazione tecnica che puoi avere e che potresti mettere in campo. 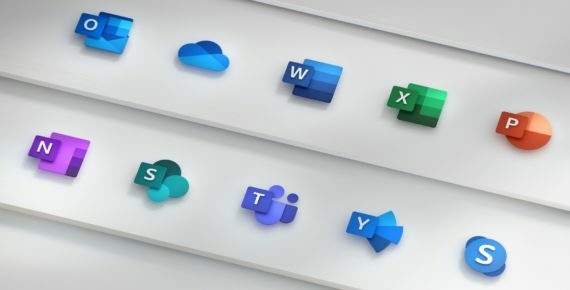 Microsoft Office 365 è un servizio ormai utilizzatissimo, ne è dimostrazione la quantità di discussioni generatasi su svariati Social Network, forum di discussione e blog specializzati con relative aree commenti. 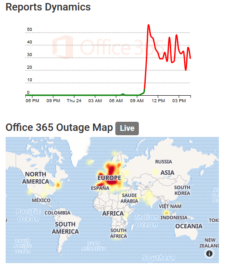 Non sono stati esenti dall’ondata di segnalazioni anche quegli strumenti che negli ultimi tempi stanno predendo sempre più piede, come Outage.report (qui la pagina di Office 365: outage.report/office-365) o DownDetector (downdetector.it/problemi/office-365). 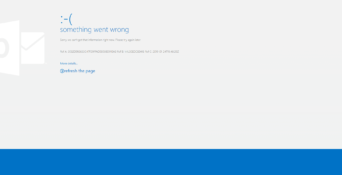 User Impact: Users are unable to connect to the Exchange Online service via multiple protocols. More info: As a result of this issue, users are receiving an error message indicating the number of concurrent connections has exceeded a limit when they attempt to send and receive email. Current status: We’re continuing to monitor the environment to ensure that service is recovering and email is being delivered as expected. Scope of impact: Impact is specific to users who are served through the affected infrastructure. Preliminary root cause: A subset of our managed Domain Controllers are in a degraded state, affecting Exchange Online functionality. Current status: We’re continuing to experience connectivity improvements and observe that email is beginning to deliver as expected. In parallel, we’re making additional changes as needed and are monitoring our email queues to ensure they continue to process. Current status: We’ve observed an increase in connectivity after deploying our solution in the affected environment. We’re implementing additional changes in an effort to provide continued relief. Current status: We’ve identified a potential fix to address this issue and are testing the fix to confirm that it is a viable solution. Current status: Our efforts to restore connectivity to the affected domain controllers continues. In parallel, we’re analyzing data to identify alternative means to restore service and better understand the underlying source of this problem. User Impact: Users may be unable to connect to the Exchange Online service. More info: As a result of this issue, users will be experiencing issues when they attempt to send and receive email. Current status: We’re continuing to fix the unhealthy Domain Controllers while actively monitoring the connections to the healthy infrastructure. Additionally, we’re reviewing system logs from the unhealthy Domain Controllers to understand the underlying cause of the issue. Current status: We’ve determined that a subset of Domain Controller infrastructure is unresponsive, which is resulting in user connection time outs. We’re optimising connectivity to the healthy infrastructure while fixing the unhealthy Domain Controllers. Current status: We’ve identified that a networking issue within the Exchange Online infrastructure may be causing impact. We’re looking into connectivity logs to determine the underlying cause and remediate impact. Current status: We’ve determined that a subset of mailbox database infrastructure became degraded, causing impact. We’re identifying the next troubleshooting steps to remediate impact. We’re investigating a potential issue and checking for impact to your organization. We’ll provide an update within 60 minutes. Current status: We’ve determined that excessive load is causing queues within the authentication infrastructure. We’re formulating a plan to remediate impact. Preliminary root cause: A subset of our managed Domain Controllers were in a degraded state, affecting Exchange Online functionality. Current status: We’ve determined that there is higher than expected queuing within the authentication infrastructure, which may be the cause of impact. We’re working to identify the cause of these queues and determine steps to remediate impact. Preliminary root cause: Previously, a subset of our managed Domain Controllers were in a degraded state, affecting Exchange Online functionality. The current cause of impact is still under investigation. Current status: We’re gathering detailed forensics within the affected infrastructure to isolate the cause of the connection time outs and identify steps to remediate impact. Current status: Our telemetry data is indicating connection time outs within the Exchange authentication infrastructure, resulting in impact to the service. We’re looking into the Domain Controller logs to understand the cause and remediate impact. More info: As a result of this issue, users were receiving an error message indicating the number of concurrent connections has exceeded a limit when they attempt to send and receive email. Current status: We’ve confirmed that the Exchange Online service is healthy and is operating within normal tolerances. We’ll continue to monitor the infrastructure to ensure that the service remains healthy. Current status: We’ve confirmed that the queued email has been successfully processed. We will continue monitoring the service throughout the business day to ensure the service continues to operate normally. 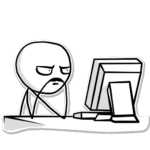 Current status: We’re observing continued successful delivery of queued email and are closely monitoring the service health. We will continue monitoring the service through the business day to ensure the service continues to operate normally. This is a continuation of EX172491. We’re targeting this communication specifically to customers who have experienced more significant impact in an effort to provide more detail, this communication will replace EX172491 on your dashboard. We understand that our initial analysis of this incident did not accurately capture the full scope of impact you have experienced throughout the duration of the incident. Through our initial investigation, we identified that some Domain Controllers (DC) in the environment had become unresponsive. We took actions to restore service to the affected DC’s and implemented a secondary fix to restore service. After completing those actions, we received reports that users were able to access the Exchange Online service and that users were beginning to receive their messages that had been sent during the Exchange Online outage. We want to ensure that you are receiving the most accurate updates related to your impact and we’re committed to keeping this as our highest priority until the root cause has been fully understood. We apologize that the user impact on our previous Service Health Dashboard post did not correctly convey the impact that your users are experiencing. Scope of impact: Impact is specific to users located in Europe that are served through the affected infrastructure. 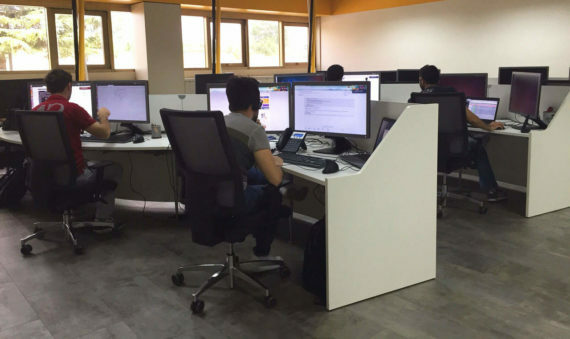 The deployment of the additional Domain Controllers (DC) is currently at approximately 12.5 percent. 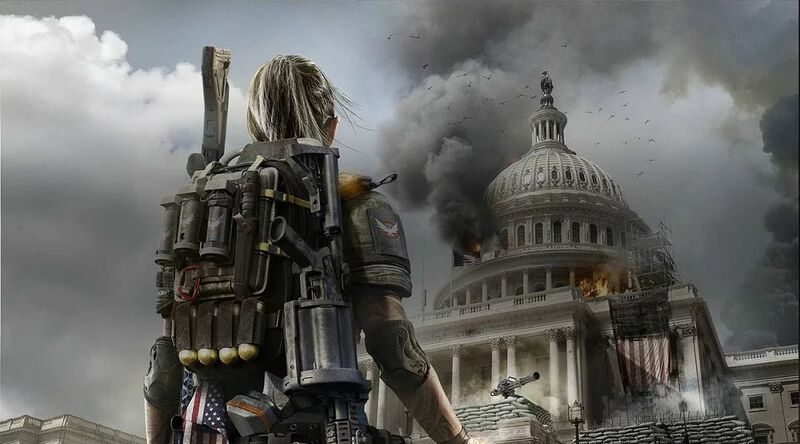 We’ve implemented the configuration change to a portion of the affected infrastructure and will monitor the environment to ensure that the connection time-outs have reduced. We’ve identified additional mitigation actions and enabled them to help prevent this issue in the future. We’re continuing in our efforts to enable additional logging. 2019-01-27 04:12 (UTC): The process in which we are adding additional domain controllers to the environment requires that the domain controllers are deployed in batches. Our third batch is still being deployed and is progressing as expected; however, this means that our deployment status remains at 50 percent. 2019-01-27 08:46 (UTC): The third batch of domain controllers is continuing to deploy as expected and we’re monitoring its progress. We’ll begin deployment of the fourth batch of domain controllers once the third batch has completed. As deployment progresses users will begin to see remediation. 2019-01-27 13:01 (UTC): We’ve completed 58 percent of the deployment of domain controllers and the third phase is progressing as anticipated. The fourth phase of deployment of domain controllers is expected to begin in approximately six hours. 2019-01-28 04:45 (UTC): We’ve completed our deployment of domain controllers and we’re performing our final validation tests to ensure all systems are functioning as expected. Additionally, the configuration change to reduce the time-outs has been applied throughout the affected infrastructure. Our current data and testing indicates that the service is maintaining optimal levels and we’ll closely monitor any changes in load or performance to prevent any additional impact. We’re continuing to monitor the service now that the configuration changes have propagated throughout the environment. We’ll continue to monitor the service throughout the working day to ensure that the improvement work we’ve done has remediated impact. Continuerò ad aggiornare l’articolo quando ci saranno ulteriori sviluppi in merito, per il momento passo, chiudo e spero che il fine settimana possa avere un risvolto più positivo rispetto a questo enorme disservizio mai così pesante per ciò che riguarda la storia del servizio. Che poi capisci che si tratterà di un anno scoppiettante e frizzantino già da ciò che accade nei primi giorni dell’anno. E mentre l’Italia si indigna pesantemente per il centesimo di costo richiesto per il sacchetto “biodegradabile” del supermercato (qui qualche informazione in più), tutto il resto del mondo (e credo anche la pressoché totalità di figure informatiche nostrane) ha di meglio a cui dedicare poltrona e pop-corn, buon anno a te da #Meltdown e #Spectre! Avevo pubblicato gli auguri di buon anno così sulla pagina Facebook del blog, e nonostante la gravità dei fatti forse molti non si erano ancora accorti della reale portata, distratti dall’ultima fetta di panettone accompagnata da chissà quale Brut servito ghiacciato. 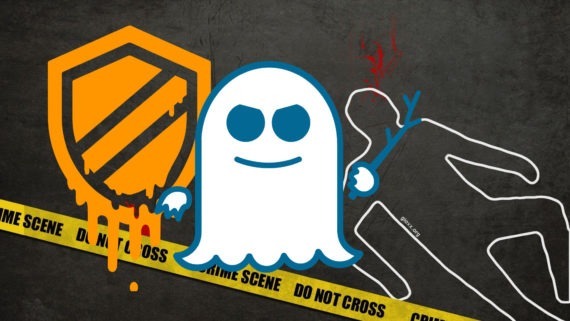 Di come Meltdown e Spectre possano essere parecchio pericolosi per la privacy dei nostri dati ne hanno già abbondantemente parlato tutti, chi più, chi meno approfonditamente (con e senza grossolani errori), la fazione di clienti possessori AMD sta già -inutilmente- esultando, quello che voglio fare io è semplicemente raccogliere una serie di link verso quegli articoli e approfondimenti già pubblicati, che raccontano in maniera giusta qual è il problema. Continuerò ad aggiornare questa “rassegna” aggiungendo –se necessario– osservazioni e spunti di discussione, perché sono certo che ogni collega lì fuori sta facendo tutto tranne che sorridere o esultare per l’arrivo di questo nuovo anno all’insegna dell’ennesimo bug di sicurezza che assomiglia più a una voragine senza fondo! (e qui ci sta particolarmente bene questo tweet). Sito web ufficiale (paper ufficiali, FAQ, ecc. ): meltdownattack.com (oppure spectreattack.com, non cambia). Google Project Zero, Reading privileged memory with a side-channel: googleprojectzero.blogspot.it/2018/01/reading-privileged-memory-with-side.html. Vulnerability Notes Database, Vulnerability Note VU#584653 CPU hardware vulnerable to side-channel attacks: kb.cert.org/vuls/id/584653. Apple, About speculative execution vulnerabilities in ARM-based and Intel CPUs: support.apple.com/en-us/HT208394. Apple has already released mitigations in iOS 11.2, macOS 10.13.2, and tvOS 11.2 to help defend against Meltdown. In the coming days they plan to release mitigations in Safari to help defend against Spectre. They continue to develop and test further mitigations for these issues and will release them in upcoming updates of iOS, macOS, tvOS, and watchOS. Intel Responds to Security Research Findings: newsroom.intel.com/news/intel-responds-to-security-research-findings. Google Security Blog, Today’s CPU vulnerability: what you need to know: security.googleblog.com/2018/01/todays-cpu-vulnerability-what-you-need.html. Ars Technica, “Meltdown” and “Spectre”: Every modern processor has unfixable security flaws: arstechnica.com/gadgets/2018/01/meltdown-and-spectre-every-modern-processor-has-unfixable-security-flaws. Daniel Miessler, A Simple Explanation of the Differences Between Meltdown and Spectre: danielmiessler.com/blog/simple-explanation-difference-meltdown-spectre. Ho atteso che Luca pubblicasse un riepilogo in lingua nostrana, lo trovi qui: cybersecurity.startupitalia.eu/56343-20180104-meltdown-spectre-due-vulnerabilita-nel-cuore-delle-cpu. Partendo dal presupposto che sai benissimo (forse) che su Linux mi muovo poco e nulla, in ufficio ovviamente si parla dell’argomento a 360 gradi (abbiamo ogni OS client / server). Qualche riferimento più orientato al mio mondo (Microsoft / macOS), a quello della virtualizzazione (VMware) e al browser (sempre più strumento principe di ogni giornata lavorativa). Mozilla Security Blog,Mitigations landing for new class of timing attack: blog.mozilla.org/security/2018/01/03/mitigations-landing-new-class-timing-attack. 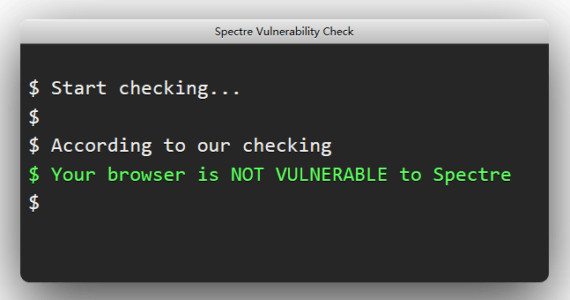 Tencent’s Xuanwu Lab ha (già da qualche giorno) reso disponibile un tool web per verificare se il browser utilizzato è vulnerabile a Meltdown e Spectre, visita xlab.tencent.com/special/spectre/spectre_check.html per cominciare. Sophos, F**CKWIT, aka KAISER, aka KPTI – Intel CPU flaw needs low-level OS patches:nakedsecurity.sophos.com/2018/01/03/fckwit-aka-kaiser-aka-kpti-intel-cpu-flaw-needs-low-level-os-patches. VMware, NEW VMSA VMSA-2018-0002 VMware ESXi, Workstation and Fusion updates address side-channel analysis due to speculative execution: lists.vmware.com/pipermail/security-announce/2018/000397.html. Google, Android Security Bulletin—January 2018: source.android.com/security/bulletin/2018-01-01. 4 January: About the Meltdown and Spectre attacks: FreeBSD was made aware of the problems in late December 2017. We’re working with CPU vendors and the published papers on these attacks to mitigate them on FreeBSD. Due to the fundamental nature of the attacks, no estimate is yet available for the publication date of patches. Synology, Synology-SA-18:01 Meltdown and Spectre Attacks: synology.com/en-us/support/security/Synology_SA_18_01. Trend Micro, Important Information for Trend Micro Solutions and Microsoft January 2018 Security Updates (Meltdown and Spectre): success.trendmicro.com/solution/1119183?mkt_tok=eyJpIjoiTW1JNU1XVXhaR05pTUdJNSIsInQiOiJnWnN2aFR0a0gzTEVHWGhRTStEWXRIWTRLWVhjWng1VmpkMm1TeEJVQ3ZVZjBWWlFUbVlNOXJ3XC9DRmNBVU1EN211cHFTam5JSDJ0XC8rYnN2UWVIa3dvbEZIWFpibHJiRklJd2xwU1ZFVFpuUVJ3QWxOc3krZFh0cTlJUnNrTUpHIn0%3D. Per esempio, in questo momento ti confermo che forzando l’installazione della patch su Windows con Symantec Endpoint Protection installato, si va a finire in un vicolo cieco che ti porterà unicamente a un BSOD (sarai costretto a usare DISM via prompt dei comandi in modalità recovery, per disinstallare il KB e poter tornare a lavorare su Windows correttamente). Symantec ha rilasciato l’aggiornamento promesso, puoi verificare tu stesso dalla finestra di Troubleshooting, il modulo “Eraser” deve avere una versione pari o maggiore alla 117.3.0.358 (nel mio caso è già alla 359). Nel mio caso, come facilmente capirai, il sistema non è ancora stato patchato. 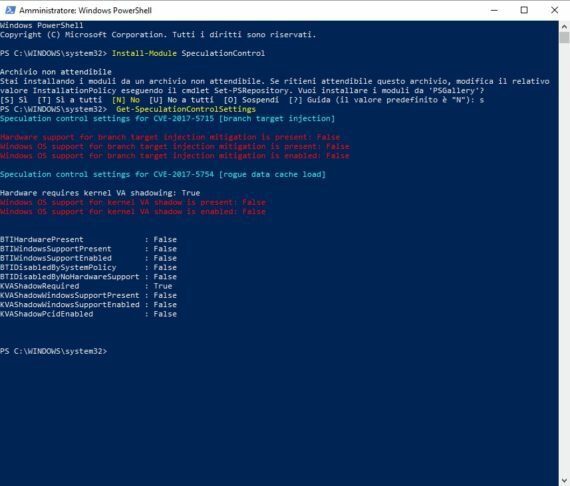 In alternativa, se PowerShell non fa per te, dai un’occhiata a questo tool. Se hai anche tu Windows 10 (aggiornato a 1709), qui trovi i dettagli sull’update che riguarda (tra le altre cose) le due nuove vulnerabilità. 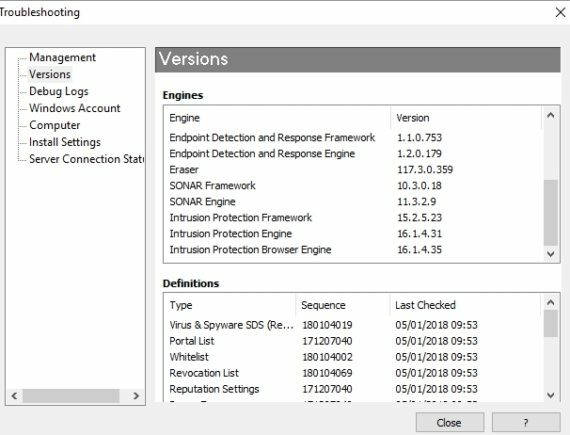 Microsoft, ADV180002 | Guidance to mitigate speculative execution side-channel vulnerabilities: portal.msrc.microsoft.com/en-us/security-guidance/advisory/adv180002. Microsoft has reports of some customers with AMD devices getting into an unbootable state after installing this KB. To prevent this issue, Microsoft will temporarily pause Windows OS updates to devices with impacted AMD processors at this time. Microsoft is working with AMD to resolve this issue and resume Windows OS security updates to the affected AMD devices via Windows Update and WSUS as soon as possible. If you have experienced an unbootable state or for more information see KB4073707. For AMD specific information please contact AMD. With Windows 10 on newer silicon (2016-era PCs with Skylake, Kabylake or newer CPU), benchmarks show single-digit slowdowns, but we don’t expect most users to notice a change because these percentages are reflected in milliseconds. With Windows 10 on older silicon (2015-era PCs with Haswell or older CPU), some benchmarks show more significant slowdowns, and we expect that some users will notice a decrease in system performance. 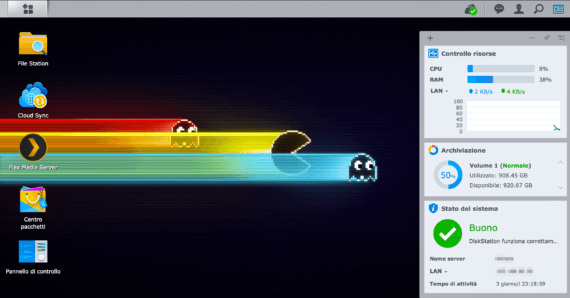 With Windows 8 and Windows 7 on older silicon (2015-era PCs with Haswell or older CPU), we expect most users to notice a decrease in system performance. Windows Server on any silicon, especially in any IO-intensive application, shows a more significant performance impact when you enable the mitigations to isolate untrusted code within a Windows Server instance. This is why you want to be careful to evaluate the risk of untrusted code for each Windows Server instance, and balance the security versus performance tradeoff for your environment. For context, on newer CPUs such as on Skylake and beyond, Intel has refined the instructions used to disable branch speculation to be more specific to indirect branches, reducing the overall performance penalty of the Spectre mitigation. Older versions of Windows have a larger performance impact because Windows 7 and Windows 8 have more user-kernel transitions because of legacy design decisions, such as all font rendering taking place in the kernel. We will publish data on benchmark performance in the weeks ahead. Trovi su GitHub una pagina che cerca di raccogliere tutti i riferimenti più utili verso documenti e patch riguardanti i vari sistemi, è disponibile puntando il browser all’indirizzo github.com/hannob/meltdownspectre-patches. La pagina è stata aggiornata, includendo molti più sistemi / applicazioni e relativi riferimenti alle advisories e alle patch già disponibili. Ti consiglio caldamente di darci un’occhiata (e tenerla comunque a portata di mano nel corso delle prossime ore / prossimi giorni). Office 365, Dropbox, Amazon, GMail. Quelli che a te sembrano semplici nomi ai quali ormai hai fatto la più completa abitudine, nascondono in realtà un minimo comune denominatore: si tratta di Public Cloud. Servizi che si trovano su server altrui, gestiti da amministratori che non sono i tuoi colleghi d’ufficio e disponibili (per definizione) 24 ore su 24, 365 giorni all’anno e 366 nei bisestili, una disponibilità garantita da strutture in grado di sopportare il carico di lavoro imposto da una clientela distribuita a livello mondiale, e altrettante strutture di backup che entrano in gioco nel caso in cui quelle di produzione diano qualche rogna. Il perché del suo successo è presto detto: è adatto a tutti. Dalla casalinga di Voghera (che come ben sai, usa GMail per inviare le sue ricette e trucchi di pulizia a tutte le amiche ;-) ) alla piccola o media impresa che può scegliere un partner affidabile, che gli consenta di controllare i costi e le risorse tempo / uomo che servono per tenere vivo e in forma quel servizio, oltre ovviamente a supportarlo ed essere sempre presenti per gli utenti utilizzatori. Contrariamente alle soluzioni ibride o private, il cloud pubblico è -ovviamente- condiviso con molti altri clienti, un po’ come funziona da sempre con l’hosting condiviso sfruttato da moltissime installazioni di software (questo blog compreso). Non per questo è meno sicuro o meno affidabile, anzi, spesso un problema che affligge un cloud pubblico è anche quello che viene risolto più velocemente (proprio perché colpisce molti, spesso troppi, utilizzatori), e questo lo noto quasi ogni giorno da amministratore di un tenant Exchange (Office 365). Chi manca all’appello? Ormai nessuno, perché sono le stesse (nuove) startup che per prime tentano l’impresa di lanciarsi (guadagnandosi l’investimento) appoggiandosi spesso al cloud pubblico e ai servizi erogati tramite esso. Parlando proprio di questi, manco a dirlo, ne è pieno il web, si spazia dal puro storage (quello professionale di Amazon, ma anche quello più semplice da utilizzare targato Dropbox, Google Drive o OneDrive) e si arriva alle istanze server vere e proprie (anche qui Amazon la fa pressoché da padrone, ma molti sono i competitor che si sono messi in gioco, e nuovi ne arrivano quasi quotidianamente), passando per applicazioni vere e proprie (GMail è forse l’esempio più lampante, ma non certo l’unico). Inutile negarlo. 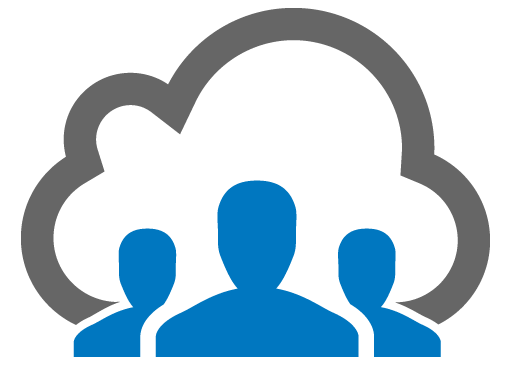 Il cloud pubblico può generare preoccupazione in quelle persone particolarmente attente alla riservatezza dei dati, poiché –per definizione– condiviso con altri clienti che sfruttano una stessa piattaforma. Normalmente però, è corretto pensare che un tenant (seppur avviato su una macchina che ne ospita diversi) è isolato e protetto, limitato alla propria piccola realtà (o media azienda), e che quei dati restino al sicuro, garantiti da chi il servizio lo eroga. […] restituire ai cittadini il controllo dei propri dati personali e di semplificare il contesto normativo che riguarda gli affari internazionali unificando i regolamenti entro l’UE. La sicurezza dei dati raccolti è garantita dal titolare del trattamento e dal responsabile del trattamento chiamati a mettere in atto misure tecniche e organizzative idonee per garantire un livello di sicurezza adeguato al rischio. A tal fine il titolare e il responsabile del trattamento garantiscono che chiunque faccia accesso ai dati raccolti lo faccia nel rispetto dei poteri da loro conferiti e dopo essere stato appositamente istruito, salvo che lo richieda il diritto dell’Unione o degli Stati membri (Articolo 32). A garanzia dell’interessato il Regolamento UE 2016/679 regolamenta anche il caso di trasferimento dei dati personali verso un paese terzo o un’organizzazione internazionale (Articolo 44 e ss) e prevede che l’interessato venga prontamente informato in presenza di una violazione che metta a rischio i suoi diritti e le sue libertà (Articolo 33). Il titolare del trattamento dei dati avrà l’obbligo legale di rendere note le fughe di dati all’autorità nazionale. I resoconti delle fughe di dati non sono soggetti ad alcuno standard “de minimis” e debbono essere riferite all’autorità sovrintendente non appena se ne viene a conoscenza e comunque entro 72 ore. In alcune situazioni le persone di cui sono stati sottratti i dati dovranno essere avvertite. 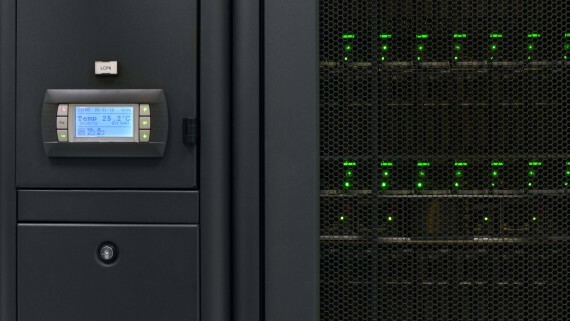 A questo ulteriore step, si associa generalmente un uptime garantito molto alto, con relativa assistenza tecnica specializzata che è sempre disponibile 24 ore su 24, 7 giorni su 7, per un totale di 365 giorni all’anno (e 366 nei bisestili! ), utile per risolvere problemi tecnici ma anche di esaudire ogni nuova richiesta basata su specifiche esigenze. In un contesto pubblico, le grandi spese e gli obblighi riguardanti il trattamento dei dati sono quasi del tutto eliminati (per modo di dire). Ricordati che garantire la manutenzione e la sicurezza di un cloud pubblico è responsabilità del provider che vende, togliendo così quel carico di lavoro all’ufficio IT del cliente, che riduce al minimo il tempo e i soldi spesi per il continuo aggiornamento del sistema e la formazione specifica (sul prodotto) del personale, permettendo a quest’ultimo di dedicarsi a nuovi progetti. Veloce (sia nel provisioning iniziale, sia nell’utilizzo), economico (nella maggior parte dei casi), estremamente scalabile (le risorse possono aumentare o diminuire in base alle esigenze, in un tempo molto rapido e andando a modificare così il costo del servizio stesso), completamente supportato (da chi il servizio lo eroga, evitando di doversi specializzare in configurazione, utilizzo e soprattutto manutenzione). Questa macchina di cui dovrai solo girare la chiave e guidare è disponibile in molti concessionari, l’Italia propone diversi provider, tra i quali c’è certamente Seeweb. La regia si prende un piccolo break e vi lascia ai consigli per gli acquisti, articoli scritti sempre e comunque dal proprietario della baracca (o da ospiti di vecchia data) ma -contrariamente al solito- sponsorizzati. Il giudizio è e sarà sempre imparziale come il resto delle pubblicazioni. D'accordo pagare le spese di questo blog, ma mai vendere giudizi positivi se non meritati. Ok l’ho fatto. Dopo anni di giochi e modifiche varie tra firmware dei router e hard disk portatili, ho detto basta. L’ho detto per la scarsa velocità di trasferimento dei dati, l’ho detto perché mi secca dovermi ricordare di collegare un disco USB al mio MacBook per mettere al sicuro i miei dati, l’ho detto perché avevo creato alcuni “single point of failure” difficili da sopportare ormai, soprattutto perché in alcuni casi non avevo alcuna copia di sicurezza in Dropbox. L’obiettivo era diventato ormai unico: centralizzare. Per questo motivo sono tornato a far parte della schiera di clienti Synology, ho acquistato un Synology DS216j. Il NAS è molto bello, elegante, leggero. Il suo peso maggiore deriva in realtà dalla somma del peso dei dischi che ospita, nel mio caso meccanici e “non troppo snelli“, devi però pensare che potresti utilizzare dei dischi SSD da 2,5″ (con slitta per poterli alloggiare e bloccare negli slot da 3,5”), anche se non consigliato (considera che i dischi SSD ai quali siamo abituati noi oggi, a meno di acquistarli specificatamente per questo mestiere, non sono fatti per sopportare carichi di lavoro molto pesanti, h24, per chissà quanto tempo). Nonostante quello che dice la mia dolce metà, un oggetto simile non sfigura in salotto, di fianco al televisore o in altra posizione, purché (consiglio molto spassionato) sia a portata di un cavo di rete che lo collegherà al tuo router (meglio se Gigabit). Pensare di collegarlo alla rete di casa affidandosi magari a dei rilanci WiFi è veramente un azzardo (e in alcuni casi rende inutile l’investimento). Nella scatola c’è tutto il necessario per procedere con il montaggio dei due dischi previsti dal NAS (affinché tu possa sfruttare così il RAID 1 che nascerà senza chiederti alcunché, parte vantaggiosa anche per chi non è proprio abituato a giocare con questo tipo di strumenti) e, una volta fatto tutto, chiuso e avvitato, potrai collegarlo alla rete elettrica e quella dati, quindi accenderlo. Da ora in poi, ci vorranno circa 5 minuti prima di sentire un “bip” audio che ti permetterà di capire che il NAS è pronto a farti fare il primo accesso. Se hai confidenza con la console del tuo router, troverai facilmente l’IP che il prodotto si è preso dal DHCP (e potrai puntarci il browser sin da subito). 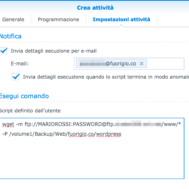 In caso contrario, potrai (dovrai) scaricare l’applicazione “Synology Assistant” dalla pagina synology.com/it-it/support/download/DS216j, che cercherà al posto tuo il dispositivo. Verrai così guidato verso l’interfaccia di accesso al sistema operativo montato a bordo di questi NAS (nel caso di Synology, il DiskStation Manager, DSM per comodità), che ti guiderà nel corso di una prima configurazione e preparazione dei dischi, così come all’aggiornamento del sistema operativo. Il tutto, considerando i tempi di comprensione di una persona media, occuperà circa mezz’ora di tempo (ammesso che tu abbia anche una decente connessione dati). Il Synology DS216j, così come gli altri prodotti di più basso, pari o maggiore livello, propongono un collegamento a uno store (il “Centro pacchetti“) che permette di installare applicazioni a bordo dell’apparato. Tali applicazioni ti permetteranno di ampliare il bouquet di servizi a tua disposizione, che esulano dal mero spazio disco che puoi “mappare” sul tuo PC, ma che comunque riportano all’utilizzo di quei dischi che pulsano al suo interno. È così facendo che potrai –per esempio– creare un mirror dei contenuti che ospiti sul tuo Dropbox, mettere in piedi un Media Center o un punto unico che concentri tutte le fotografie scattate, tue e dei tuoi familiari, anche da cellulare. Ogni applicazione è descritta anche in italiano, tutto viene spiegato in maniera chiara, difficile sbagliarsi, tuttalpiù si farà qualche test, ci si accorgerà di non aver messo in piedi l’applicazione necessaria per la propria esigenza e la si disinstallerà, passando al successivo test, diventa anche un modo come un altro per conoscere meglio lo strumento che si ha a disposizione, le sue possibilità e le proprie capacità nel configurarlo al meglio. Il Centro pacchetti però, come prevedibile, è limitato, il numero di applicazioni è importante ma non infinito, per questo motivo esistono fonti esterne che permettono di espandere quel catalogo proponendo nuovi software, tutti in grado di girare su DSM (appositamente pacchettizzati). Uno dei possibili assi della manica è synocommunity.com, che darà accesso in maniera semplice a un bel bouquet (qui potrai farti un’idea: synocommunity.com/packages). Una volta aggiunta la fonte al proprio Synology, si potrà aggiungere una qualsiasi tra le applicazioni disponibili passando direttamente dal Centro pacchetti, al quale nel frattempo ti sarai abituato. Personalizzare il proprio Sinology è semplice, devi soltanto curiosare tra le sue opzioni, perdi il giusto tempo per capirle e provarle, possibilmente senza spingerti oltre quello che a primo colpo non comprendi, perché si tratta di dispositivi molto venduti e quindi molto discussi e supportati dalla comunità. Se non vuoi perderti nelle decine di alternative in lingua inglese (anche se personalmente te le consiglio), puoi sempre fare riferimento a qualcosa di nostrano, come synologyitalia.com. Il forum affronta le varie tematiche legate a questo mondo, ai modelli di Synology sul mercato (e non solo), pacchetti da installare e metodi alternativi a quello previsto di fabbrica, firmware. Avere un NAS in casa risolve molti problemi legati alla centralizzazione dei dati e alla loro sicurezza (data dal RAID), ma questo credo che tu l’abbia capito dopo così tante righe di articolo. Ciò che -forse- ti interessa di più, è capire come mettere in pratica il tutto, un suggerimento di configurazione. Provo a descriverti sommariamente la mia, magari ti può tornare utile anche per specifiche tue esigenze. Lo so benissimo, Windows Xp non dovrebbe più esistere sulla faccia della terra, hai ragione. Ho una vecchia macchina, un Netbook (te li ricordi ancora? ), montava Windows Xp Sp 3 in origine, lo avevo formattato e ci avevo installato Windows 7, cercando di ottimizzarlo quanto più possibile, ma sono dovuto tornare indietro dopo circa un anno, le prestazioni sono calate (parecchio). Lo utilizza ancora la consorte, ci tiene in ordine le ricette di cucina, le spese, ci naviga e controlla la posta, nulla più. 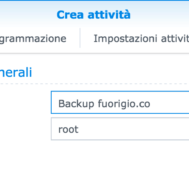 Fino a quando vivrà, avrà bisogno di Dropbox, perché è lì sopra che tiene in backup tutto. Dropbox però non supporta più Windows Xp, dall’agosto dello scorso anno. 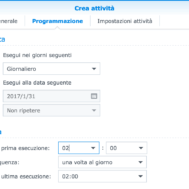 Utilizzo già Cloud Sync sul Synology DS216j, ho solo dovuto creare un utente ad-hoc per quel PC, aggiungere una voce all’elenco attività del connettore Dropbox (è facile, ti basterà seguire una procedura guidata molto banale) tenendo l’attività in sincronizzazione bidirezionale ed ecco fatto, una semplice mappatura di rete su quel Netbook permetterà di tenere vivo il collegamento con Dropbox, il resto è stato solo un junction su Windows Xp (roba del 2010 eh, nulla di nuovo sotto al sole). Davvero, una cosa stupida, che attualmente non esiste ma che spero possa essere integrata in una prossima versione del DSM. C’è il work-around, per motivi abbastanza ovvi, e si basa su un semplice script e sul sempreverde wget. Riassumo: un processo schedulato, un collegamento FTP e una cartella nella quale depositare i dati. Ovviamente al posto di <username> e <password> andranno indicati i relativi dati di collegamento al tuo spazio FTP, così come al posto di <server_ip> il giusto server. Dovrai modificare anche /volume1/CARTELLABACKUP con la destinazione corretta, quella scelta sul tuo NAS, per ospitare i dati che vuoi scaricare per tenere da parte un backup. Cosa c’è di sbagliato in tutto questo? Nulla, sulla carta, nella pratica non riuscirai a controllare un avanzamento di quanto appena lanciato (puoi verificare l’occupazione cartella di destinazione e il numero di file che compariranno al suo interno, è vero), così come non riuscirai a bloccare il processo da interfaccia grafica (dovrai abilitare il collegamento SSH al tuo NAS e fare tutto da terminale), al massimo potrai monitorarlo. Un’altra mancanza. Niente work-around stavolta, a meno di far passare l’archivio fotografico da Google Drive, ma in quel caso viene a meno quella caratteristica così comoda messa a disposizione da big G, lo spazio non limitato sui server di Mountain View a patto di tenere la risoluzione non originale (ma comunque di buona qualità), ideale per le fotografie scattate da cellulare. Avrei voluto mettere in piedi un ponte per tenere sotto backup le fotografie dei miei smartphone e di Ilaria, ma non solo. Ho provato a dare un’occhiata a Photo Station (applicazione consigliata per chi possiede un Synology) ma non mi ha soddisfatto. Resteremo su Google Photos, con la speranza che venga integrato in una delle applicazioni del DSM in futuro. 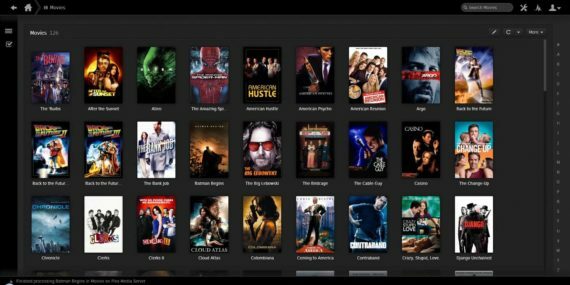 Ho installato Plex sul Synology DS216j, funziona bene, sono soddisfatto e ho ovviamente aggiornato il tutto secondo documentazione ufficiale, odio quando un pacchetto è troppo indietro rispetto alla release ufficiale dello sviluppatore, e quelli di terze parti su Synology non vengono proprio aggiornati tempestivamente (ho notato che la versione 0.99 è rimasta quella “più aggiornata” secondo il NAS per diverso tempo, quando in realtà eravamo arrivati ben oltre da diversi mesi). Ho scritto prima di questo rispetto al pezzo dedicato all’oggetto intero, speravo di chiuderlo un po’ prima ma evidentemente non è andata così. La pecca? Non tutti i file video vengono correttamente processati e mandati in onda sul televisore (tramite Chromecast), per alcuni serve un po’ più potenza di fuoco (CPU e RAM) per poter essere correttamente encodati e mandati in streaming. Per questo motivo sono stato costretto a riaccendere il Plex della macchina Windows sempre viva in casa, è lei che si occupa di fare quel mestiere con i file più ostici, pur prendendoli da NAS. Un buon prodotto, modulabile (considerando le applicazioni disponibili ufficialmente ma anche quelle provenienti da altre repository), che si adatta abbastanza facilmente alle esigenze ma che ancora ha qualche piccola lacuna che -credo- non sarà difficile da colmare, e il tempo potrà dire se questo mio “vecchio articolo” (quando lo sarà) ci aveva visto giusto o no. 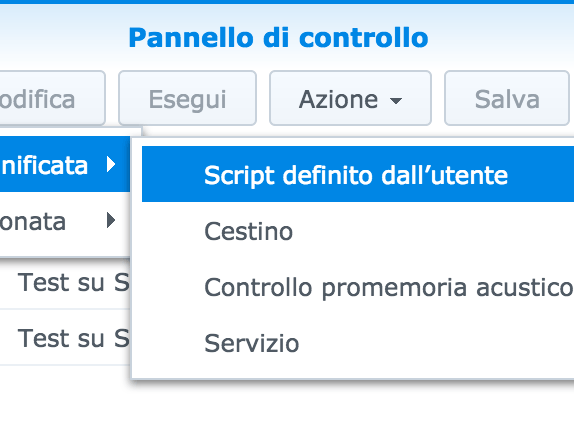 Synology non tradisce e riesce anche a mettersi al livello di quel consumatore che probabilmente non conosce poi così bene l’argomento, che non è abituato a parlare di mirroring o script da terminale, è un po’ a portata di chiunque (l’importante è volersi applicare). Non ho volutamente parlato di specifiche prettamente tecniche, non sono voluto scendere in quel dettaglio che potresti non riuscire a seguire dopo qualche riga, per i puristi c’è sempre la pagina dedicata (e qui trovi anche le prestazioni misurate). Il costo dell’apparato è sufficientemente bilanciato a ciò che si ottiene. Rimane una spesa tutto sommato contenuta se si possiedono già i dischi fissi, tutto aumenta se devi mettere in piedi da zero il tuo concentratore di dati, come nel mio caso, e ti consiglio personalmente di investire qualche soldino in più ma fare le cose per benino, non comprare a occhi chiusi se non sei sicuro di quello che stai per fare. Già che ci sei, utilizza il sito web di Synology per verificare la compatibilità del Synology DS216j con prodotti di terze parti (hard disk compresi): synology.com/it-it/compatibility?search_by=products&product_bays=2&product_name=DS216j. Prodotto: tutto pagato di tasca mia (sono circa 300€ di spesa). È un bell'investimento ma risolve tante beghe. Più che una vera novità, questo vuole essere un riepilogo sui servizi più importanti e richiesti di Seeweb, società della quale vi ho già parlato in passato e che continua a collaborare con il sottoscritto per promuovere prodotti e servizi che altri competitor non offrono (o lo fanno a diverso prezzo e magari con un’assistenza tecnica non sempre puntuale, pro-attiva e disponibile). Seeweb è stata tra i primi fornitori di cloud computing in Italia (nel 2009 presentarono i primi prodotti in cloud), con quattro Data Center di proprietà (due a Milano e altrettanti a Frosinone), per un totale di 2500 mq di spazio dedicato a servizi di cololocation e cloud computing. A luglio dello scorso anno, hanno inoltre costituito una holding atta a testare un nuovo mercato, quello sud-est europeo. Non è (solo) il ferro a fare di un servizio il giusto partner tecnologico, bisogna soprattutto poter fare affidamento a una squadra di persone capaci, informate, che sappiano fare il loro mestiere e che possano quindi supportare (e sopportare, in alcuni momenti critici) le richieste di un cliente spesso non preparato, che ignora come tutto il suo palcoscenico possa stare in piedi senza perdere un colpo. Un palcoscenico dove ogni attore porta a casa la sua pagnotta, facendo allontanare soddisfatti gli spettatori a fine spettacolo. Il mestiere del provider non è mai semplice. Provate ad immaginare migliaia (e più) di clienti, i più disparati casi di supporto, problemi legati ad aggiornamenti che spesso non vengono eseguiti nella giusta maniera, possibili falle che possono essere sfruttate da chi ha intenzioni ben poco amichevoli nei confronti del vostro sito web, e di conseguenza verso il server che vi ospita (spesso mettendo in pericolo altri clienti, se non opportunamente isolati e protetti). Chi vive il web da anni dovrebbe saperne qualcosa (me per primo). Ma perché va così di moda parlare di Cloud, SLA & co.? Perché l’innovazione tecnologica che stiamo vivendo ormai da qualche anno a questa parte, consente ad aziende come Seeweb (e non solo, ovviamente) di fornire un supporto più puntuale, preciso, rapido. Risorse costantemente scalabili secondo le esigenze del cliente finale, mai banale quando si tratta di tenere a bada siti web particolarmente impegnativi, che potrebbero crescere fino a superare quel pacchetto inizialmente pensato, valutato e acquistato presso il provider scelto. E se domani doveste avere necessità di più GB su disco? E se crescete a tal punto da giustificare un aumento di banda mensile che non avreste mai pensato di raggiungere? Essere online significa poter contare su un partner che assicuri una raggiungibilità pressoché eterna, sempre disponibili, h24, 365gg / anno e 366 nei bisestili. Essere offline vuol dire perdere visibilità, forse clienti, sicuramente visitatori. Ecco perché è importante valutare provider che offrano servizi di uptime garantito, dietro condizioni di SLA che possano rimborsare una giusta cifra nel caso in cui un servizio non funzioni a dovere. Perché mi deve interessare lo SLA? Lo avrete capito: il partner scelto è importantissimo per la buona salute del vostro progetto. Voi chi avete scelto? Avete già avuto esperienze con Seeweb? Se si, come vi siete trovati? L’area commenti è sempre a vostra totale disposizione, anche senza obbligo di registrazione.